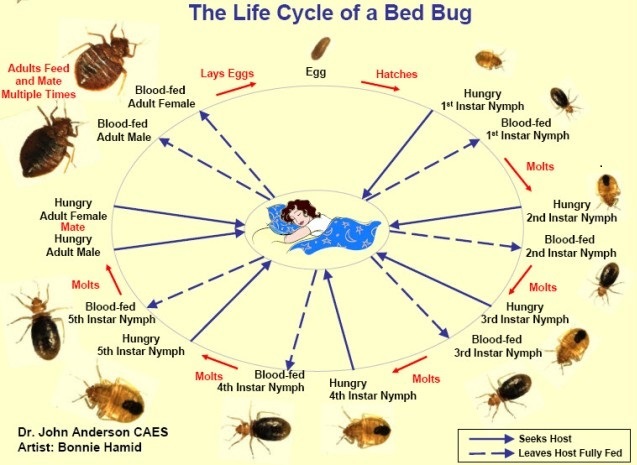 The Bedbug life cycle starts with an egg. 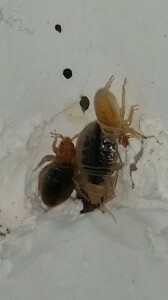 After birth the bed bug will move through 5 instar or stages, ending with adulthood. While they are moving through the 5 stages they are referred to as a nymph. In order to move from stage to stage during the lifecycle of a bed bug, a bed bug needs to feed on a mammal. They prefer human blood, but will feed on other available animals such as a pet or bat. They can feed several times during each stage and as much as 1x per day. 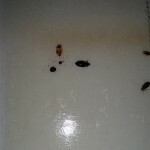 As the bed bug moves from each stage or instar they will molt as they grow. A bed bug will impale its human host at night to withdraw blood, although if a bedbug has gone without feeding, they might try and feed during the day. A nymph will look for a blood meal right after hatching from an egg. Room temperate plays a role in how fast bedbugs move through the life cycle. 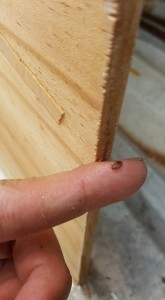 If the temperature is between 70 and 80 degrees F, the bed bug takes approximately 4 to 5 weeks at 83-90 degrees F to move from egg, through the juvenile or nymph stages, and to adulthood. Three generations of bed bugs could be born in a year. The lifespan of an adult is 10 to11 months, although they could live for a year without feeding. 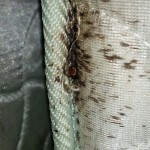 A female bed bug will lay 1 to 3 eggs per day and 200 in a lifetime. 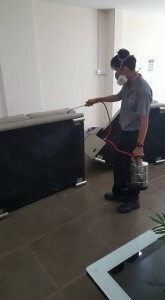 The bedbug eggs stick to areas where they are placed and are therefore difficult to remove with a vacuum. The eggs are approximately 1/16 inch and are oval. They are white/yellow in color. 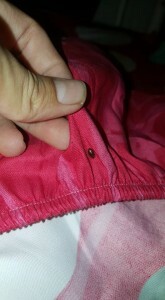 Bedbug Eggs take approximately six to ten days to hatch. Although the bites are painless, most people develop allergy reaction to the saliva injected by the bugs when they bite. Swelling may be severe and extend beyond the immediate bite area in highly sensitive individuals. There is no evidence of bed bugs transmitting any diseases to human; however, the concern is due to the secondary infections from scratching.